Create a business-to-business marketing campaign that will make hospitality professionals feel welcome by getting a vast list of contacts in one consolidated hotel email list. Find important people within the hospitality industry and start connecting with them in minutes through one easy hotel contact database. To reach an exciting and influential business audience, check in with some of the key people at hotels, motels, and hotel chains with this premium hotel contact list. Perhaps your company's product or service can assist hospitality professionals in booking stays, organizing information, maintaining facilities, providing food, or taking care of their guests. Let them know about your company through email, mail, or phone calls with the accurate contact information in this ready-made hotel email list. This data pulls the contact information of key decision-makers across inns, hotels, and motels into one resource. By cutting out hours of research and integrating into your CRM seamlessly, this resource can make your B2B marketing efforts timelier and more effective. You'll have everything you need to market your relevant product, service, or network with this spread-out group: emails, phone numbers, fax numbers, addresses, names, titles, and more. Be of service to these influential people in the service industry and take the first step toward boosting sales when you download our verified hospitality database, which can serve both as a comprehensive directory of sales leads and a hotel mailing list. 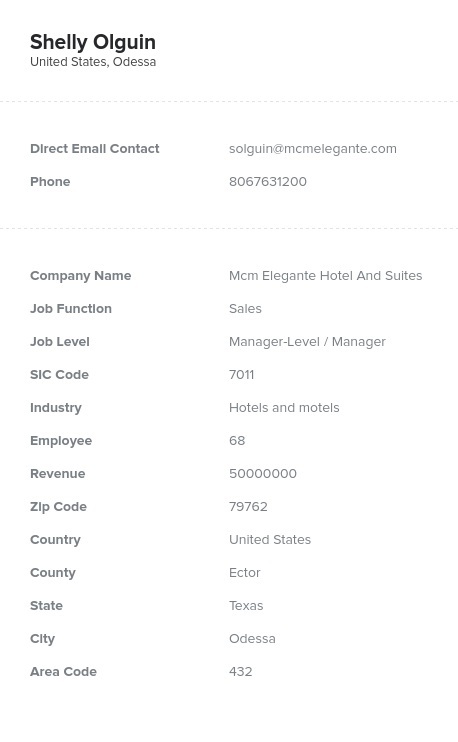 With this hotel contact list, you can email leads, send mail, or start calling the right people within this industry. Either buy this affordable, pre-built hotel email database or customize your own list with our innovative list-builder tool. Reach out to the masters of rest and relaxation and market to hotels and motels with the help of Bookyourdata.com's targeted hotel email list!